Can I unlock my 'locked' lampholder? 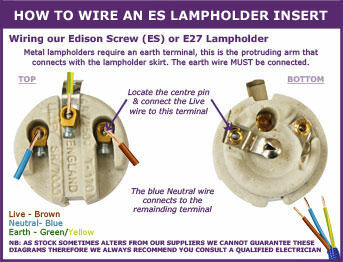 Edison Screw lamp holders have a safety feature that mean once put together they cannot be unscrewed. This is to ensure you do not unscrew the whole lampholder when changing the light bulb. Safety essential, but not ideal if you have put it together and need to unscrew it again. However with a little patience, it IS possible. See our video on our below to see how. Why is my lampholder not working? Inside the lamp holder are two grooves. The insert should be slotted into the grooves. 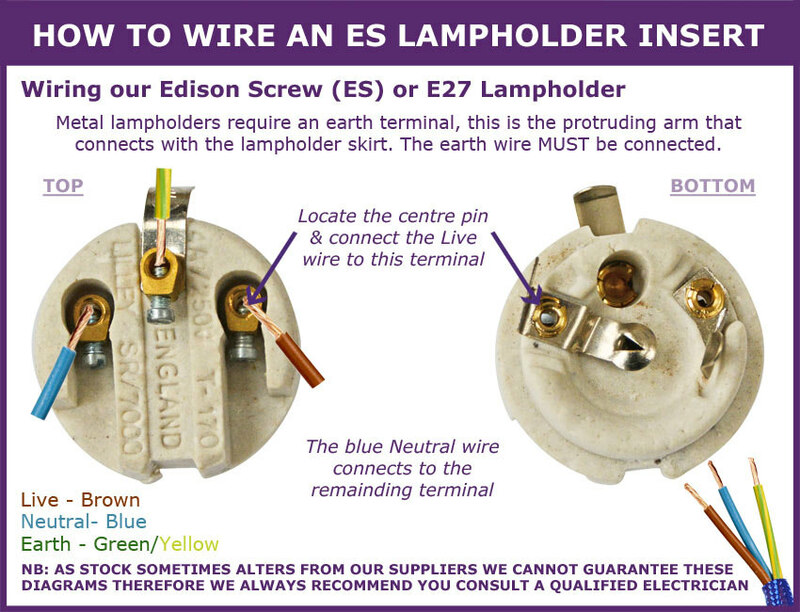 If it isn't inserted correctly then the lamp holder will not connect to the bulb properly. You could also check that the earth wire is not preventing the switch from seating properly so the pins are not depressed enough to make the safety contact. Which wattage bulb can I use with my lamp holder? Our BC and SBC range of lampholders are both 2 amp rated so you can use a bulb up to 60W. Our ES are higher amp rated at 4 amps so you can use a bulb of up to 100W. You can use LED bulbs with our lampholders as long as they are the equivalent wattage rating. Please see our Light Bulbs Information Page for more details & help in choosing the right LED bulb. The other consideration when choosing a bulb is what shade will be used. Generally the shade should have the same wattage rating as the bulb. So whilst you can rate the lamp holder this could change with the use of a fabric or paper shade and caution should be taken and advice taken from a qualified electrician. What bulb fitting do I require? SBC - small bayonet cap fitting takes a SBC bulb. Also known as B15d . Measures 15mm across. BC - bayonet cap fitting takes a BC bulb. Also known as B22d. Measures 22mm across. SES - small edison screw fitting takes a SES bulb. Also known as E14. Measures 14mm across. ES - edison screw fitting takes an ES bulb. Also known as E27. Measures 27mm across. GES - giant edison screw fitting takes a GES bulb. Also known as E40. How do I wire an ES lampholder?